Let's make 2015 a year to remember! I've decided my new year's resolution this year is to spread and share the amazing good fortune and blessings I have received over the past year. It's my goal to unite my family, as well as our local and online communities, in a project of raising funds to build a much-needed safe water point in a community where this basic resource is a precious and scarce commodity. Any amount you can give will help and go directly toward the planning and execution of the water infrastructure project. Once construction is underway, we'll receive updates, photos, and specifications, and I plan to throw an awesome celebration for all our donors and supporters once we meet our goal! $5,000 will achieve "Project Underwriter" status, providing a solid foundation of funding and ensuring a well project with life-sustaining benefits can be built and maintained. Please explore the Water Project site for more details on this great work. Please consider donating to this cause; our well will make a real, tangible difference in people's daily lives. Thank you!!!! UPDATE 3/9/2015: Today I had the pleasure of speaking in front of the Berlin Rotary Club. It was an exciting opportunity to talk about the world water crisis and how the Water Project is giving ordinary folks like me a chance to be a part of the solution in Africa. The club members have some great connections and expertise in the area of water projects, so it was quite an honor to speak to them and gain their valuable support! Thanks again to everyone who has donated so far. Your incredible generosity is bringing us closer to the goal every day! And get ready to celebrate World Water Day on March 22nd! 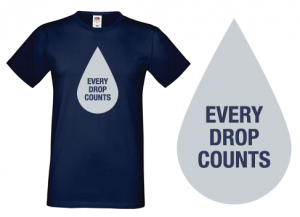 It's not too late to purchase a World Water Day shirt. Please follow Shannon's Water Project Fundraiser on Facebook to keep up-to-date on the latest fundraisers and water project news! 03/17/15 Len And Darlene O'Hara $102.00 Love you. Actionable empathy always. 02/14/15 Mary (Horsington) Santoro $50.00 What a wonderful project! Good luck on meeting your goal. 01/16/15 John Campbell $40.00 I appeal to all my fellow Aquarians to be water bearers and contribute to this fundraiser! 01/02/15 Tim & Cindy Pauldine $46.00 Good luck with your goal! 12/31/14 April Margera $115.00 Good Luck with your endeavor!! 12/31/14 Cynthia Wetterlund $50.00 Thank you, Shannon, for the opportunity to contribute to this vital work! 12/31/14 Donna Wetterlund $50.00 So proud of you for paying it forward!